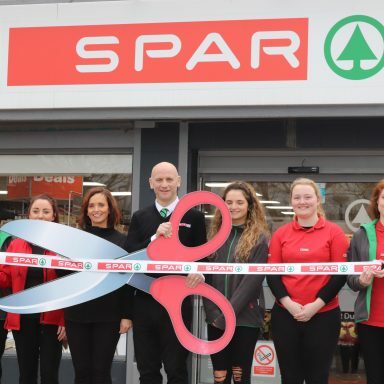 A £12.5m warehouse designed to streamline logistics at the Henderson Group, one of Northern Ireland’s leading businesses, has been officially opened by the managing director of SPAR International, Tobias Wasmuht. The 180,000 sq ft new warehouse at Henderson Group headquarters at Hydepark in Mallusk incorporates cutting-edge design from across the SPAR International network, which operates in 44 countries, with over 12,500 stores and annual retail sales of over £33bn. 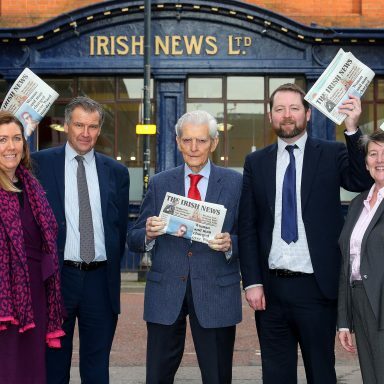 As the owner of the SPAR franchise in Northern Ireland, Henderson Group is part of the global network. This new facility is set to benefit 447 independent and company owned stores which it supplies across Northern Ireland. The opening of the domed warehouse, which will store ambient products, is the most recently completed phase of a redevelopment scheme which will see the Henderson Group invest over £30m in land acquisition and new buildings at the Group’s headquarters. The first phase saw the opening of Henderson Group’s new group office building at Mallusk, an investment of £3.5m, earlier this year. The next phase will involve the redevelopment of the company’s chilled and frozen distribution warehouse on the same site, another £12.5m project. Tobias Wasmuht, Managing Director, SPAR International, officially opened the ambient warehouse during a visit to Northern Ireland to attend a SPAR International LOGIT (Logistics and Technology) conference, hosting around 100 SPAR delegates from all over the world to showcase best practice. He said: “SPAR International is the world’s largest voluntary food retail chain and the key to our success is finding the right partners. 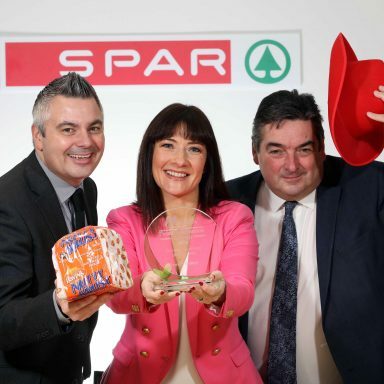 “We have been working with the Henderson Group for over 50 years to enable SPAR to deliver to retailers and customers in Northern Ireland and investment in this new warehouse is an important step forward in allowing the brand to continue as the market leader in convenience retailing. “Our focus is on listening, adapting and fine tuning our international best practices and combining the best of global with the best of local and the cutting-edge warehouse is a prime example of that. Lead contractors for the project, which was completed in just nine months on a site previously owned by Marks and Spencer, were Fermanagh-based Tracey Brothers. Martin Agnew, Managing Director of the Henderson Group, said: “Henderson Group has seen excellent growth over the last 10 to 15 years and we outgrew the site that we had. 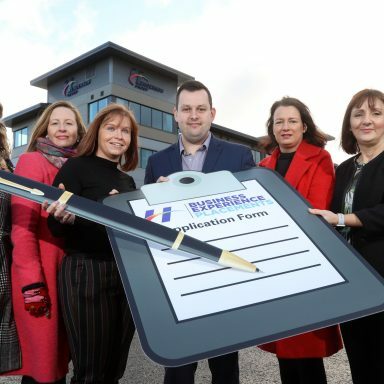 “When the premises adjacent to our site became available in 2015 we purchased them and began planning and developing a completely new warehouse, one of the biggest of its kind in Northern Ireland and doubling our previous warehousing space. “It was ideal as this location is excellent for the delivery of goods arriving from Larne and Belfast ports and has good access to 447 stores across Northern Ireland that we supply. Pat McGarry, Logistics Director of the Henderson Group, explained that when designing the facility, the focus was on achieving maximum efficiencies both in terms of energy consumption and in speed of loading and unloading products, especially in the bulk stack area where fast moving products like promotions are managed. He added: “We have specially designed 20 metre loading bays where we can move goods in and out in one place with eight new loading docks which help load double deck vehicles efficiently as well as 31 other loading and unloading doors. The product layout is as close to the store layout as possible which simplifies the distribution process. “The focus is on energy-saving, especially when charging mechanical handling equipment like forklifts and we have installed motion sensors which mean that all the lights don’t stay on at full power all the time unless someone is working in that area. Among the products which will pass through the warehouse each year around 100,000 tonnes of goods with the most popular being Coca Cola as well as over 50 million litres of other soft drinks.